One of TEL’s most popular resources is the Health and Wellness Resource Center. The Health and Wellness Resource Center provides authoritative information on a full range of health-related issues, from current disease and disorder information to in-depth coverage of alternative and complementary medical practices. 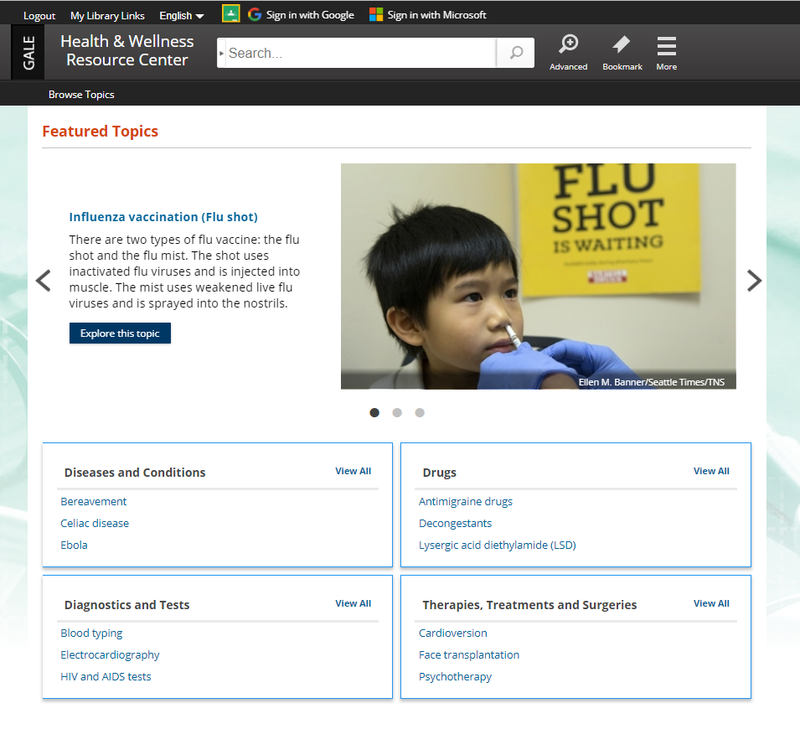 Inside you’ll have access to full-text medical journals, magazines, reference works, multimedia, and much more! One of the best features of this database is that Gale publishes their information in plain, easy-to-understand language! Another great, free resource that provides information about diseases, conditions, and wellness issues is MedLine Plus. MedLine Plus is a free, public online source provided by the National Library of Medicine. MedlinePlus offers health information in non-technical, understandable language. You can easily look up prescription drugs, over-the-counter medicines, herbs and supplements. Find out why your doctor orders various laboratory tests and what the results may mean. You can even watch surgical videos so you are fully prepared for any surgical procedures. You do not need to be a health professional to use MedlinePlus, although it is used by many health providers. If you are looking for the latest information published in peer reviewed journals, you may want to check out Health Reference Center Academic. This database provides up-to-date information on the complete range of health care topics for students, consumer health researchers, and health care professionals. Health Reference Center Academic includes full-text periodicals, reference books, pamphlets, and hundreds of videos demonstrating medical procedures and live surgeries to ensure that researchers get current, scholarly, comprehensive answers to health-related questions. These are just a few of the databases on TEL, don’t forget to check out the other Health resources available at https://tntel.info/general-public/health.